A chatbot is a service, powered by machine learning algorithms and sometimes artificial intelligence, that you interact with via a chat interface. Chatbots are useful for a growing number of use cases. In any case, you shouldn’t put resources into one on the off chance that won’t work for you. What customer service benefits can you expect from a chatbot? Multi-platform support – Multi-platform messaging gives bots a utility beyond novelty. With bots as facilitators, users can access services in their preferred form of communication. It supports over eight major messaging platforms – Messenger, Slack, Skype, Kik, Telegram, Line, Webchat, Viber. Easy 10 minutes setup – Easy setup makes it possible for anyone willing to make a chatbot easier. Engati thus helps you setup a chatbot in hardy 10 minutes without requiring coding at all. Web Widget Integration – It allows integration of any small application to your own chatbot. Detailed Engagement Analysis – With its ability to understand natural language and codify it, it allows tracking of most frequently asked questions, chatbot actions, cohort analysis that can be used everywhere from product development to cost reduction. 365X24X7 Support — Unlike your support staff, Chatbots don’t need any breaks, they happily work and learn 24 hours a day. They have a robust cloud architecture. Response Personalization – Personal information about the user is used to personalize chatbot conversations helping them recommend in an efficient way. Easy chatbot training – With all of the rich information coming from analytics, you can get a handle on how to train the bot. You can train your bots as per your customer queries and needs with our additional features like DOWNLOAD and UPLOAD. 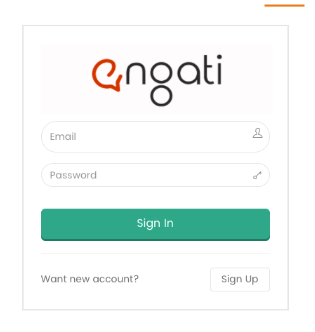 Signup for your new account , goto https://app.engati.com. The simple interface allows you to quickly setup your account or simply sign-in using your credentials. Dashboard – As soon as you are logged in to your account, you will see a navigation menu on the left side of your browser window. Dashboard is the first module displayed on the menu. It gives administrators an overview of important site information. The dashboard displays the result of your website to read in a statistical format at once. One can read through the detailed conversational statistics here. 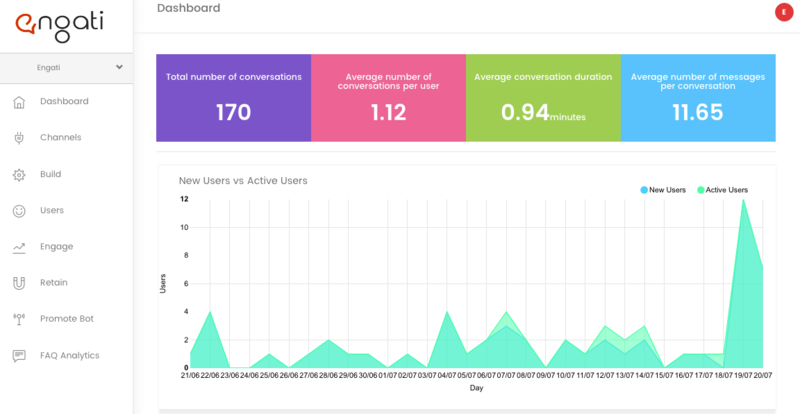 Graphical view of new and active users, monthly, daily and weekly active users and the total number of conversations happened till date can be seen on the dashboard. Channels – Different Channels are presented to you through Channel Modules and can be administered by you. It is the platform with which you want to integrate your chatbot with. You can select the channel for your chatbot for the relevant platform – Facebook Messenger, Slack, Skype, Kik, Viber, Telegram and Line and follow the setup guide to configure. Build – Building and training your chatbot with the most relevant answer is the key to efficient customer communication. You can build your chatbot and then train your chatbot in this module with the most frequently asked questions(FAQs). 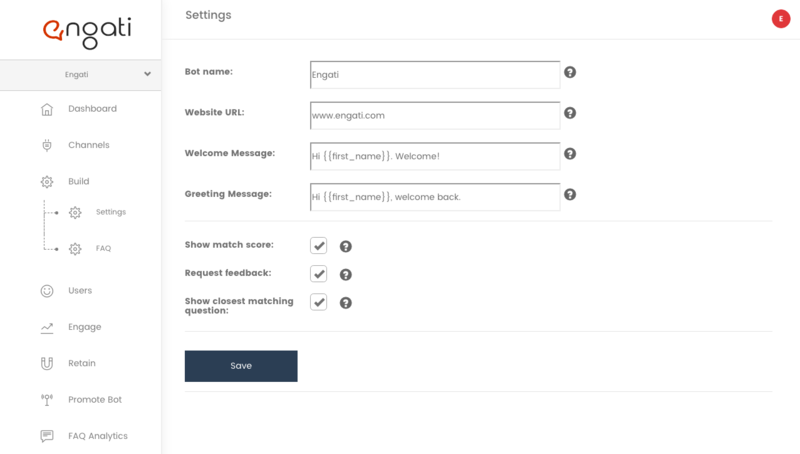 In Build>Settings, you can setup your bot by setting your bot name (the name by which your bot will be displayed to the users) ,the URL details (to link the bot to your website), welcome and greeting messages. 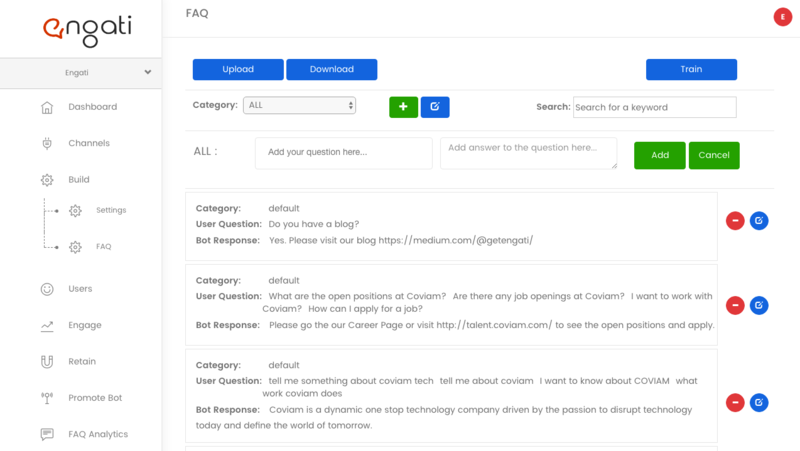 In Build>FAQs, you can train your bot to answer in a more accurate way by entering the multiple question variations for an answer. You can even upload and download the list of the frequently asked questions in CSV format for faster setup. Date on which user started communicating with the bot. Last date on which the user communicated. Platform/Channel the user used to communicate with chatbot. Profile picture if communicated through any social media site. It also allows you to enable or disable the chat bot for the particular user if some administrator or customer support staff wants to take over the conversation running with the user or maybe just disable the conversation with some user . Engage– Chatbot is gaining its importance for user engagement. 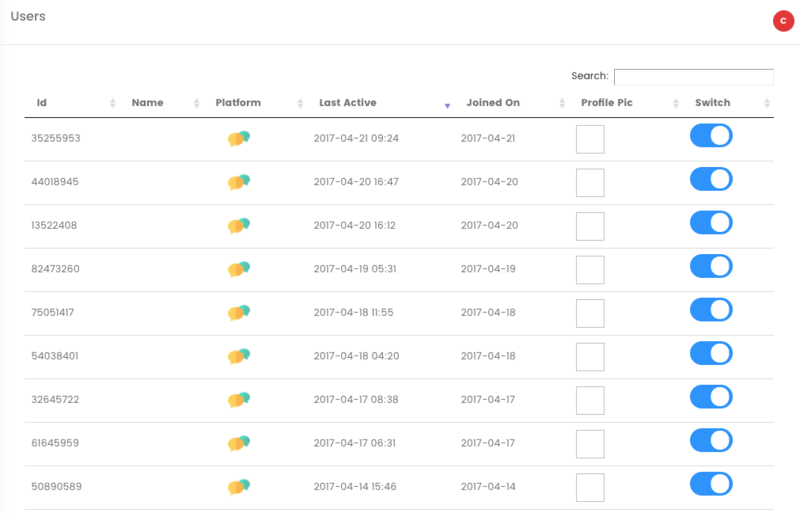 By navigating through Engage, this module will help you find out the analyzed interactions and engagement between your bot and user. By viewing the most frequently used messages and average conversations per user in this module, it will help you enhance your conversational flow with the outputs of your examined data. Retain– It will help you view details how retained are your chat bot’s users. 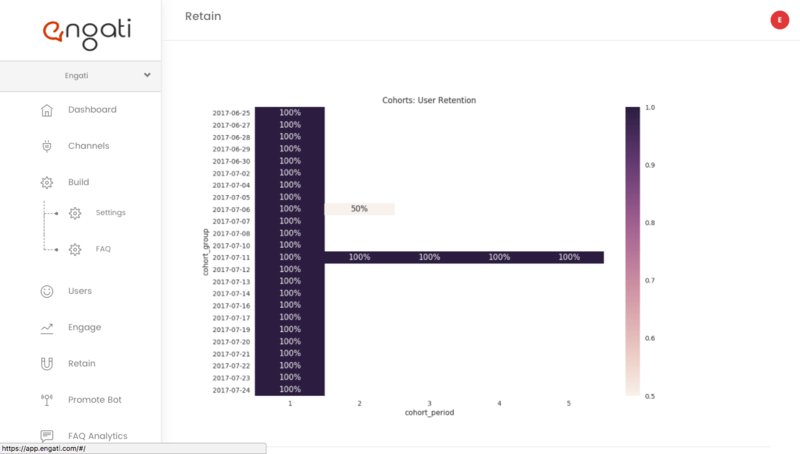 Cohort analysis is a tool to measure user engagement over time. Cohort resembles to one group with same features. It will allow you to see patterns clearly across the life-cycle of a user. Cohort analysis spot changes in cohorts over time and measure usage. The information generated by this analysis helps improve customer acquisition and retention activities. Adding a “Send Message” button on your Facebook page to promote your chatbot. 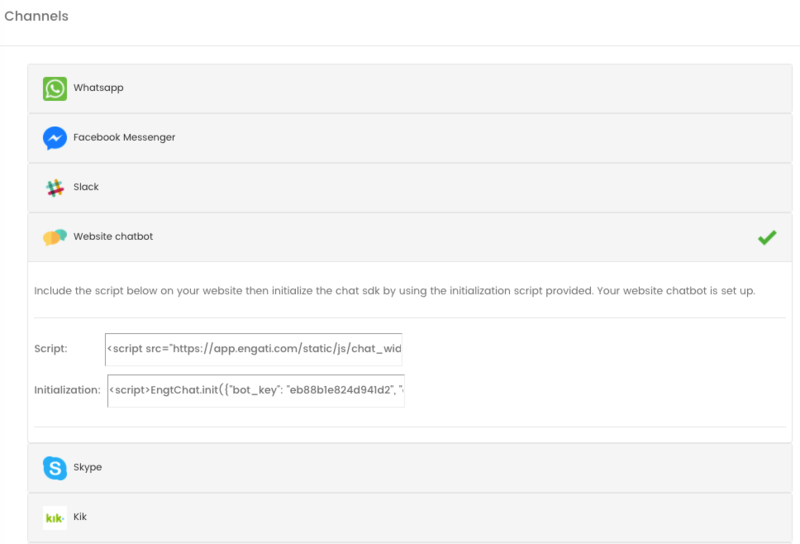 Drive additional traffic to the bot from your website by placing Send to Messenger and Checkbox plugins on your website, which enables your page visitors to connect with your chatbot in one click. A Messenger Code can be scanned by camera in Facebook and Messenger mobile app to instantly lead a user to your bot. 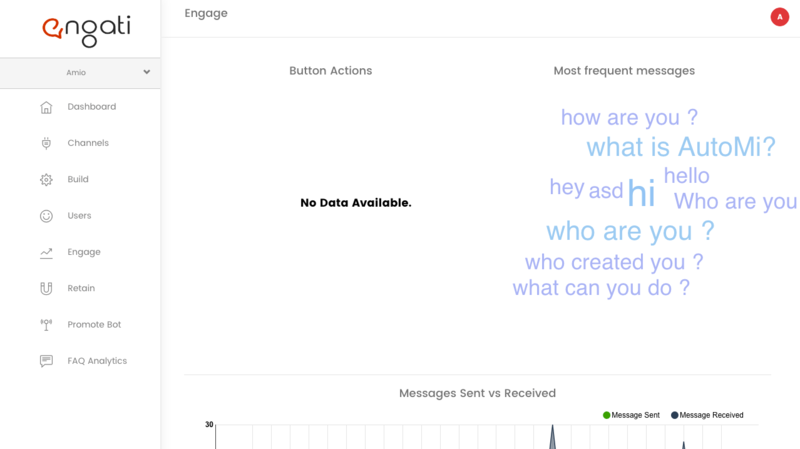 FAQ Analytics – Gives you detailed description of conversation between user and the chatbot developed. 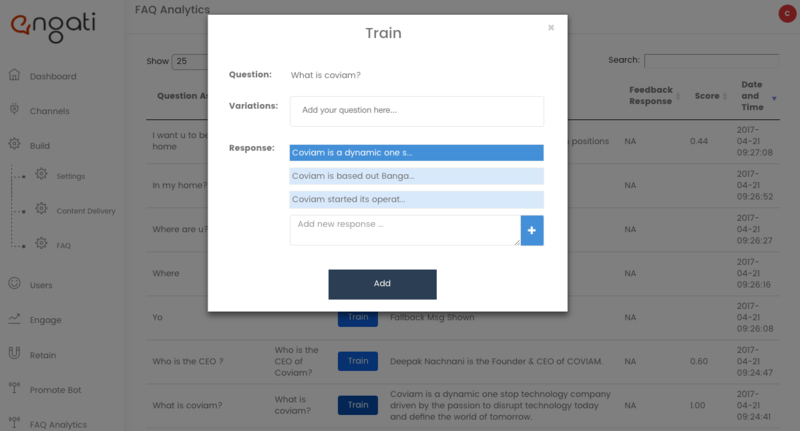 You can see the question asked by the user , the response given by the bot and if the response given isn’t accurate or if it isn’t answered by the bot, you can train your bot by simply selecting “Train” button on the list and train your bot for that specific question or rectifying the answer by providing another response. It even gives you the date and time on which the question was asked and answered by the chatbot. The confidence score column helps you in finding how close your response was to the user’s question. Thus FAQ analytics is a conversational analytics tool that helps chatbot makers to improve human-to-bot communication, identify bottlenecks and increase engagement.